Tom Watson, Labour's own Ser Gregorstein? How has the Labour "mainstream" reacted to a second impending defeat in the Party, and its fourth consecutive electoral defeat (to Corbyn twice within the party and under both Ed Milliband and Gordon Brown in successive general elections)? Almost to a man (they are mostly men) they have stared into the abyss and blinked. Labour is an irrelevance. We know it is irrelevant because it's in the news every day and they all keep saying that it's irrelevant. The entire media is ghoulishly drawn to, even obsessed with, Labour's irrelevance, its stinking awful shitness. One person who is especially sure that Labour is an irrelevance is Blair lackey and stalwart of the "modernising" faction Alastair Campbell. He is so sure of this that he keeps cropping up in the media to blame "the posh boy revolutionaries" who are "pulling the strings" of Labour and, of course, to plug the release of his latest diaries. I only mention these diaries because they cover the years after his ejection from Tony Blair's government, when he was revealed as personally responsible for the "dodgy dossier" that sanctioned the Iraq War. The diaries end with Blair's 2005 pyrrhic victory on one of the lowest turnouts ever, with millions of working class voters deserting Labour. But of course none of the resulting squalor is Campbell's fault. Campbell is someone who once - disastrously - pulled the strings of power himself. He should know it when he sees it. And those he accuses of being "posh boy revolutionaries" - i.e. Jeremy Corbyn and John McDonnell - are clearly pulling few strings. In this grinding war of attrition, it is quite clear the power lies not with the leader but forever elsewhere. Each time activists and members take a step towards making party structures fairer, more transparent or more democratic, the locus of power shifts, and new decisions emanate from some previously unseen compartment of the machine. 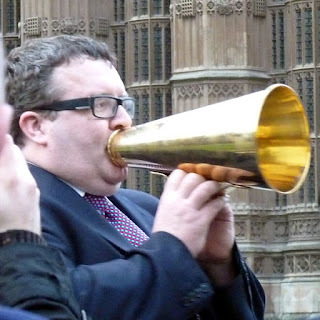 There is a nice visual metaphor for the amorphous, diffuse nature of power and it occurs every time someone takes a photo of Tom Watson. There is one famous photo of the Labour Deputy giving a wry side-eye to Jeremy Corbyn at some event in "happier times." Watson does much the same when he sits alongside Corbyn in Parliament. He wears an inscrutable, strangely assured smile aimed at no one and nothing in particular, hands clasped angelically across his front. This is the inscrutability of power made flesh. As Michel Foucault said, power is everywhere and nowhere at once. It can't be dissected and labelled. More specifically, when power is located it morphs into something else, manifests itself in other channels. Watson looks like a mere old school fixer, a crooked hangover from the age of the "organisation man." Even his burly demeanour somehow suggests the 1970s. He'd fit perfectly into a world of grubby meetings in pre-fab office blocks, all drooping blinds and the smell of stale smoke. But that smile and the vaguely artificial sheen of his face distinguish him slightly from the knuckle-dragging Labour right. He is more insidious - gliding through Labour's internecine strife, never breaking a sweat. Das Gleitende: that which slides, moves, slips. That which cannot be pinned down. Given Watson's peculiarly contradictory position - as the embodiment of a form of power which is itself diffuse, porous, disembodied - it is unsurprisingly difficult to grasp his own stance on matters Labour. Nor is anything he says of much interest in itself: “I thought [Corbyn] would realise that to lose the confidence of 80% of your MPs means that you can’t lead the Labour party," he told a Guardian journalist. This thought, so plain and out of context as to be almost empty of significance, is only betrayed by Watson's own reputation as the ultimate Labour deal broker. It was after all Watson who triggered Blair's resignation by quitting the front bench. If he is reminded of those machinations now, he is not letting on. Watson talks through his plans for Labour as if they were technical fixes to a faulty engine, but they are all ultimately political and amount indeed to a return to exactly the kind of situation where his own resignation could bump off the likes of Tony Blair. The real enemy appears to be the "disastrous" outbreak of one-member-one-vote democracy in the Party. Recently Tom Watson lost his cool, just for a moment, when his tongue got in the way of his grammar and he spoke of "Trotsky entryists" "caucusing and factionalising and putting pressure where they can, and that's how [they] operate." This rare clunkiness suggests Watson is struggling to make the picture fit. The ultimate backstage Brownite fixer, whose own head contains the blueprints for a root and branch rewrite of Party rules, wants to criticise others for their factionalising. Watson will either outlive us all or be felled in combat - perhaps to rise again, like some parliamentary Ser Gregorstein, to defend his MPs from rampant cultists. But he will become so toxic in the process that eventually he will be marginalised, reduced to what his burly form portends - the mere fixer, the oafish brawler, the walking wrecking ball. Yet even for the most reflective of "moderates" the Labour story takes the form of tragedy. And with the tragic form come definite ideological inflections: a narrative based on fatally flawed heroes is limited to accounts of individual quirks and failings. Beyond that lies merely the cosmos, vast and uncontrollable. There can be no deeper or more thorough explanation. So, for Jason Cowley, editor at the New Statesman and fellow traveller of the Blair years, Labour's Golden Generation - all white, male Oxbridge graduates, all expertly picked by Tony himself - fell on the swords of their own arrogance. "In 2000, everything seemed set fair for the Golden Generation. Nothing could stop them from dominating public life for decades to come. Apart from one another, as it turned out." Well, the scene is set for some fratricidal bloodletting. Yet for Labour moderates there is scant catharsis. To briefly survey the scene at curtain fall: David Miliband lies skewered by his own Brussels-regulated banana; Ed his "quasi-Marxist" brother drowned in a sea of unfeeling, professorial wonkery; the other, rounder Ed has morphed into a cool dad, a real life David Brent, his frustrated, under-appreciated higher functions channeled into fumbling footwork on Strictly. It is necessary to restate what a total, catastrophic failure these people have been. Not only from a leftist point of view but also by their own standards. David Miliband ran for Labour leader - too late - and lost. His brother won and then lost the following general election. Balls came third in the leadership election then lost his parliamentary seat. Burnham failed to win the Labour leadership twice and now wants to be mayor of Manchester, to no one's great enthusiasm. Insofar as an explanation is given - by Campbell or Cowley or anyone else - it is simply that Labour grew too brash, too self-confident, too distant from the electorate. This, mind you, was a deliberate choice - a simple mistake, a quirk of personality and/or natural exhaustion. Presumably the solution is to redo the whole thing as before but this time at less distance from the electorate. In the impoverished imagination of the Labour moderate, who has discounted from the beginning any serious redistribution of wealth, power or control, this new closeness to the electorate can mean only one thing: bashing immigrants. Except they forget: Blair and then Brown and then Milliband did that. And they still lost votes. "Some of [the choices] have been small, others large, but together they have turned the party inwards rather than outwards, looking to the past rather than to new ideas, resting on easy rhetoric rather than taking hard decisions – and above all seeking to distance ourselves from our time in government, rather than building on it, in terms of both policy content and political culture and dynamic." Doesn't it send shivers down your spine? This is the sort of nonsense Blair once cultivated, a toned down version of which he sometimes slipped in to his speeches or amplified for the purposes of pleasing 'Marxism Today' readers. There's nothing wrong with binaries, of course, but just look at them in isolation and it's like a nursery school sing song - small/large, inwards/outwards, new/old, easy/hard and so on. This say-what-you-see list is the quality of thought we have come to expect from Labour's best and brightest. Underlying David M's rhetoric is the simple proposition that people make choices and sometimes they are bad ones. Now, in the context of a spiralling debate on the nature of structure and agency, this statement of the obvious might chime with clarity. But that is not what we have and it is not what it does. Rather this bald presupposition is the sum of David's thinking on the subject and it provides what little theoretical framing he gives to his swooping rhetoric. In the end he comes across as a chiding uncle, the spinner of home truths you've heard a thousand times before. These are not stupid people. They were indeed the future once. Many were expensively and no doubt effectively schooled. Some have demonstrated, in their time, a more cunning grasp of the cogs of a media-dominated democracy than Jeremy Corbyn ever has. Mandelson is possibly more post-Marxist in his strategic thinking than McDonell. All of which suggests that their inability to think their own predicament through is a symptom in the Freudian sense. There are things that hide in plain sight. For people outside the situation the explanation is obvious. But for all their detective work the Labour moderates are incapable of recognising the clues as clues. So the explanation - their own retreat from democracy; the systematic erasure of party politics from daily social life by neoliberal political practice; the crisis of social democracy and representative politics across the west - eludes them. In the structure/agency debate they should be having, the Blairites are those who made history, but not in conditions of their own choosing. Those conditions have overtaken them. They are histories' dupes - the more foolish for believing they could keep abreast of its wave.